Modern day audiences often view important and innovative products supported by strong marketing, advertising and sales efforts as areas primarily related to 20th and 21st century businesses. Ask a few motor vehicle historians, however, just how competitive the early auto industry was and they will instantly point to numerous examples of a trade that was extraordinarily aggressive from the start. Rolling the clock back another half-century, there's another, even more intense - and often cutthroat - approach to sales and market share inside America's very first transportation industry. To set the stage a bit more, the discovery of gold in the west created unparalleled opportunity for entrepreneurs, as the public - by the hundreds of thousands - raced past the Mississippi and Missouri rivers toward the setting sun. The vastness of our national landscape and the efforts to both develop and support the unparalleled expansion were a boon for wagon makers. Their rapid individual and collective growth clearly reflected this truth. The advance of this segment is particularly noticeable during and after the Civil War as wagon-related patents began to sharply increase and parallel the wide-spread use of these dead-axle vehicles. By the mid to late 1880's, the industry was a well-oiled machine, pumping out as much as a million or more vehicles per year and about as much in the way of brand-specific hyperbole. 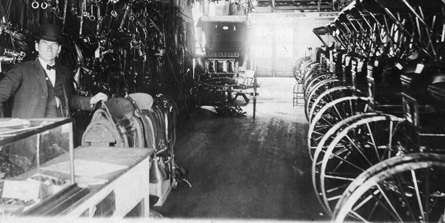 During this same timeframe, Clement Studebaker - President of Studebaker Bros. Manufacturing and the National Carriage (Wagon) Builders Association - reported that the country was home to at least 80,000 horse-drawn vehicle makers. Many of these grew (as did Studebaker) to become giant corporations with huge advertising, sales and marketing leverage… And leverage they did. With wood stock being a primary and essential raw material, control of these resources was an important offensive and defensive strategy for competitors. In some cases, the harvesting rights to huge tracts of hardwood forests were exclusively secured; effectively cutting off opportunities for key competitors to purchase sufficient quantities of quality timber at more reasonable prices. Additionally, brands jockeyed for sales advantages through price wars and patent protections as well as efforts to restrict distribution channels. Lawsuits - both frivolous and legitimate - were effectively employed to distract and hamper rivals. 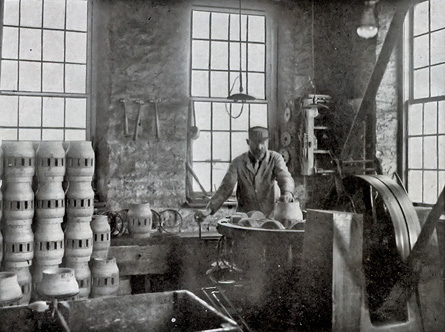 Major makers not only kept a close watch on their own business statistics but were equally well-versed in the strengths and weaknesses of their competitors. 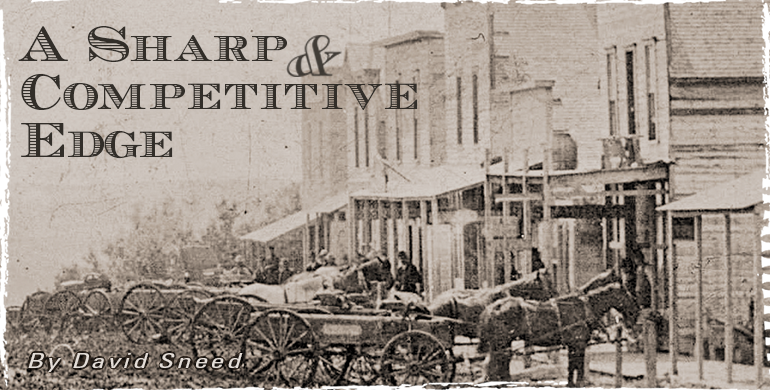 Many builders had agents (dealers) who, in order to secure local business, were not above telling a tall tale or two in derision of a competitor. With no internet or instant communication available from other sources, these methods could cause a buyer to rethink a previous loyalty to a particular brand. Some builders even went so far as to duplicate the same paint designs, construction techniques and body-style jargon of competitors to further cloud the identities of more favored makers. Military and Indian contracts were especially hard-fought-for. So much so, that disputes and accusations could and did spill over into the courts. Combined with national political lobbying and connections to local government and finance markets, there were a broad range of tactics in the competitive arsenal of many early wagon builders. Adding to a seemingly endless sea of business challenges; bank failures, economic depressions, devastating fires, workforce issues and sufficient capital for growth all fueled a commercial environment full of large risks and even larger opportunity. It's a reality extraordinarily consistent with 21st century free enterprise. Incredibly, this battle for transport dominance both inside America and in exports abroad was tightly woven into an equally dramatic western stage; all of it working to help showcase some of the country's most dramatic historical events. 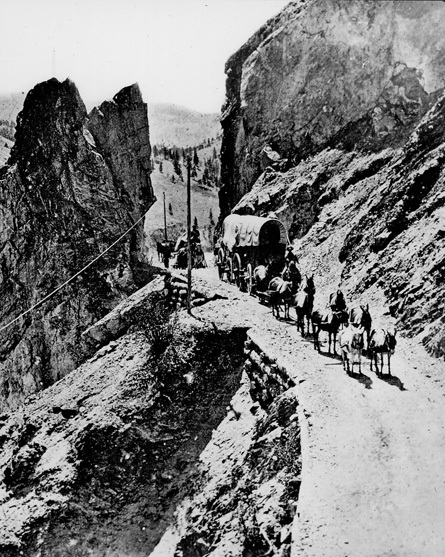 As a vital part of the legendary nineteenth century cattle drives, military operations, outlaw exploits, pioneer travel, gold shipments, freighting companies, overland coaching, railroad building and more, these vehicles and makers were among the most essential and active participants propelling U.S. growth and prosperity of the time. Through it all, successful builders relentlessly searched for additional opportunities to overshadow competitors. It's a broad-reaching legacy that has been largely overlooked; due in part to the sheer enormity of the subject. Today, more and more pieces of this portion of America's western history are coming into sharper focus and the picture is increasingly one of savvy marketers supporting epic feats and dramatic, nation-building history. While time and attrition have taken their toll on millions of heavy, wooden vehicles built during the 19th and early 20th centuries, every aged survivor now stands as a reminder of the sheer tenacity of our forefathers. Ultimately, the making of these wheeled workhorses is a story filled with stories - Accounts of real people driven by a spirit to survive and succeed - Visions bent on embracing opportunity with gritty conviction and action-filled determination. For centuries, America's wagon and coaching industry carried the wealth and will of the nation. Rolling through some of the roughest, most unforgiving terrain on earth, they united the land with insatiable momentum. It was the kind of ambition and bona fide business acumen that helped build a strong foundation for transportation while reinforcing an ambitious pace for industry and innovation throughout the United States.